What Is The Deal With Joint Pain Creams? | Do They Work? Do Joint Pain Creams Really Work? Everyone’s been there at least once. Maybe it’s a sudden tinge or a quick, painful ache in a sore spot somewhere on the body. Was it the knee after climbing a flight of stairs? The shoulder after a morning on the tennis court? That’s when the same old remedies make their way out: a bag of frozen vegetables on the sore spot, maybe a heating pad and some lying down. Then a check of the medicine cabinet for that chemical-smelling ointment dad used to use. But what if there was a joint pain reliever that could help keep the frozen foods in the freezer and do away with the raggedy old heating pad? Flexcin’s Motion Lotion is the fast-acting, easy-to-use topical cream that knocks out pain. What makes Motion Lotion stand out is its all-natural, no side-effect formula with patented CM8, invented by Dr. Harry Deihl in 1962. Motion Lotion doesn’t bring that burning sensation or freezing feeling to your skin, nor does it have a scent that can clear out a room. The lotion doesn’t have nonsteroidal anti-inflammatory drugs, better known by the FDA as NSAID, which have brought about warnings for potential liver damage associated with both topical and ingested products. When pairing Flexcin Motion Lotion with Flexcin’s Joint Maintenance formula capsules, those stairs will be a breeze and you’ll never have to come off the tennis court. Motion Lotion is for fast and effective relief from symptoms of sports injuries, repetitive movement, inflamed joints, neck and low back strain or pain, muscular and joint aches and some types of nerve inflammation. Results are best if applied as directed and taken in conjunction with Flexcin with CM8 capsules which work from the inside out to nourish joints and reduce inflammation. DUE TO DEMAND OF FREE SAMPLES, WE ARE NOW OUT OF STOCK. However, we do have an “It works or it’s free!” guarantee. 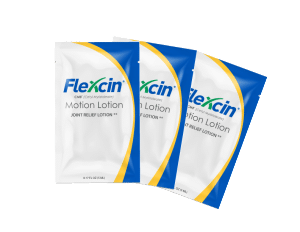 If you try Flexcin Motion Lotion and are not fully satisfied with the results, you may return the empty container (up to 3) for a full refund of the purchase price. And, if you would just like to try a small amount, we have a 7-day supply available for only $5. Due to a huge demand on our free Samples we are now out of stock. Try some of our Flexcin Motion-Lotion Products!